NES Ninja Gaiden (USA) in 11:05.82 by Slotermeyer. 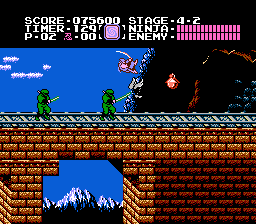 Ninja Gaiden is a classic action platformer that is known to be quite difficult. This 8-second improvement to the previous movie is the fourth published movie of this game. Surprisingly, the improvement in this version compared to the first version published in 2004 is only 14 seconds. This means that the first movie was already very good and that small new timesavers have slowly been discovered since the first movie was published. To see what's changed from the previous version by the same author, check the author's comments at the submission page.